I bet when William Stolzenburg wrote his previous book, "Where the Wild Things Were," he didn’t figure he would later find one of the wildest things in the Americas on a walkabout that stretched from the Black Hills of South Dakota, through Midwestern farms and cities, across major rivers, and all the way to the urban megalopolis of the East Coast. But Stolzenburg latched on to this true story of mystery and hope, and the result is a gripping and wise travelogue for our time. "Heart of a Lion" tracks a young male cougar as he moves out from an overcrowded wild “island” into the unknown in search of a new home and a potential mate. As the cougar winds his way out of the Black Hills, Stolzenburg’s retracing makes historical and scientific detours that add immeasurably to the tale. Imagine: A 140-pound young male lion spends two years traveling 2,000 miles. His trek is monitored, though the whole story would not be pieced together until later, by 15 sightings and DNA samplings along the way. Frequently close to people, he harms no one, preferring what his kind has long preferred: deer, of which there are more than enough. As might be expected, many humans overreact to the possibility of a mountain lion in their midst; some show patient fascination, and others cheer him on — even while knowing that his chances of success are slim. Our fear of predators, thought Chatwin, was the root of our need to tell stories. As the South Dakota cougar continues east, we get a look at how modern ecological stories have changed. Teddy Roosevelt, a bundle of bully contradictions, blusters by. There are sightings of Aldo Leopold, wolf killer turned ecological prophet. Politicians and nonprofit organizations put in appearances and make a lot of noise. And the cougar walks on, past the Twin Cities, across the Mississippi River, past Green Bay and across Michigan’s Upper Peninsula. He vanishes for a time, then, nearly a year later, he’s seen in a back yard in Lake George, N.Y.
Summarizing recent studies that sprang from monitoring predators in Yellowstone, Stolzenburg describes healthy “landscapes of fear,” that is, how entire ecosystems improve when missing predators return. Fearful grazers retreat into the shadows, thus allowing saplings and flowers to grow, thus allowing bugs and beavers and birds to return, thus allowing rivers to run clear. In a corner of Wyoming, the key is wolves preying on elk. Nearly everywhere else it could be cougars and deer. The landscape of fear that we are today a part of is rather different. Our primordial nightmares still exist, though we no longer have to retreat into the shadows. 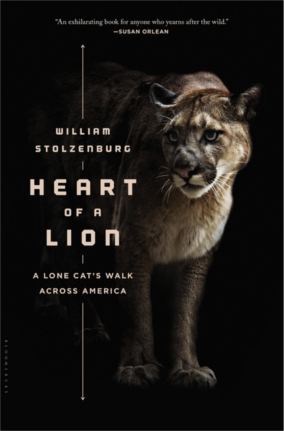 Tools like fire and firepower make us think we are kings of the jungle, whether verdant or concrete, and Stolzenburg’s telling of the cougar’s trek often made me shake my head at our misguided actions. But he describes some wise actions, too. The cougar’s unexpected trip through wild and domestic, rural and urban, shows that to preserve predators and the health of the land we need more than ecosystem restoration and linkages. Let’s embrace some mystery — easy enough when considering a ghost cat. Perhaps more importantly, we ought to increase the three C’s of the wilderness restoration mantra to four: Cores, corridors, carnivores – and compassion. More stories like "Heart of a Lion" would help. — Jake Vail is an Information Services Assistant at Lawrence Public Library.